BBC SO and Chorus under Andrew Davis. Tchaikovsky: The Tempest. Anthony Payne: Of Land, Sea and Sky. Bruch: Violin Concerto No 1. Vaughan Williams: Toward the Unknown Region. Live at BBC Proms: Sir Andrew Davis conducts the BBC Symphony Orchestra and Chorus in Vaughan Williams and a new work by Anthony Payne. 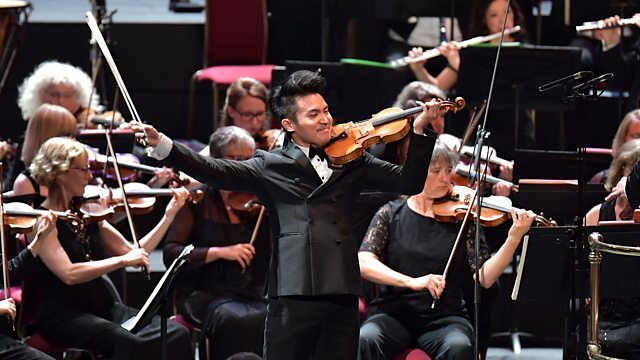 And Ray Chen plays Bruch's Violin Concerto. Writer Melissa Harrison describes a classic English midsummer walk in a thunderstorm. An excerpt from her acclaimed collection Rain: Four Walks in English Weather. Vaughan Williams's Toward the Unknown Region was his first large-scale masterpiece, setting the visionary words of Walt Whitman. Sir Andrew Davis also conducts Tchaikovsky's swashbuckling The Tempest and the world premiere of Anthony Payne's Of Land, Sea and Sky, with texts by Payne himself which reference nature and the Somme. Bruch's radiant First Violin Concerto completes the programme. 'Harrison is writing us a new kind of modern pastoral: peopled, raw, messy and shining.' Helen Macdonald, author of H is for Hawk. Orchestra: BBC Symphony Orchestra. Conductor: Sir Andrew Davis. Performer: Ray Chen. Orchestra: BBC Symphony Orchestra. Orchestra: Royal Liverpool Philharmonic Orchestra. Conductor: Vasily Petrenko. Tchaikovsky: Manfred Symphony, The Voyevoda: Royal Liverpool Philharmonic Orches.